Rudy Gobert notches 22 points and grabs 11 rebounds to lead Utah over Los Angeles. Count down the best plays from Tuesday's NBA action with the top ten. • Appeared in 61 games (25 starts), averaging 8.2 points, 4.5 rebounds and 3.9 assists in 25.8 minutes. • Scored in double figures 22 times, including one game of 20+ points. • Grabbed 10+ rebounds five times. • Led team in scoring once, rebounding eight times, assists 18 times and steals 10 times. • 12/3/14 vs. Chicago, scored a season-high 20 points. • 11/11/14 at Portland, grabbed a career-high tying 14 rebounds. • 1/31/15 at Denver, dished a career-high 13 assists. • Appeared in 78 games (all starts), averaging 13.8 points, 7.2 rebounds and 4.6 assists in 35.3 minutes. • Finished second in voting for the Most Improved Player award. • Recorded five triple-doubles, leading the NBA and setting a Pacers franchise single-season record. • Led the team in both rebounding and assists. • Led all NBA guards in rebounding. • Scored in double figures 64 times, including 13 games with 20 points or more. • Grabbed double-figure rebounds 22 times and handed out double-figure assists six times. • Including triple-doubles, recorded 20 double-doubles. • 11/11/13 vs. Memphis, recorded first career triple-double with 13 points, a career-high 12 assists and 11 rebounds. • 11/22/13 at Boston, tallied 10 points, 11 rebounds and 10 assists. • 12/22/13 vs. Boston, posted 12 points, 10 rebounds and 10 assists. • 1/30/14 vs. Phoenix, had 14 points, 10 rebounds and 10 assists. • 4/13/14 vs. Oklahoma City, notched 17 points, 11 assists and 10 rebounds. • 1/16/14 vs. New York, scored a career-high 28 points. • Grabbed a career-high 14 rebounds on two occasions, 1/28/14 at the Lakers and 3/28/14 at Washington. • PLAYOFFS: Appeared in 19 games (all starts), averaging 13.6 points, 6.9 rebounds and 4.2 assists in 37.1 minutes. • 5/20/14 vs. Miami, tied a playoff career-high with 29 points. • Played in 78 games (72 starts), averaging 8.8 points, 3.9 rebounds and 2.9 assists in 29.2 minutes. • Scored in double figures 36 times, including three games of 20 points or more. • 3/27/13 at Houston, scored a season-high 21 points. • Tallied a season-high 11 rebounds on 1/30/13 vs. Detroit and again on 3/15/13 vs. the Lakers. • 3/6/13 vs Boston, had a career-high five steals. • PLAYOFFS: Appeared in 19 games (all starts), averaging 9.4 points, 7.6 rebounds and 3.3 assists in 35.4 minutes. • Appeared in 42 games (one start), averaging 2.5 points, 1.3 rebounds and 1.1 assists in 10.5 minutes per game. • 4/25/12 vs. Chicago, scored a season-high 22 points in first career start. • 1/11/12 vs. Atlanta, scored 12 points, grabbed five rebounds and handed out three assists. • PLAYOFFS: Appeared in four games (zero starts), averaging 1.5 points in 3.0 minutes per game. • Appeared in 12 games (zero starts) as a rookie, averaging 3.1 points, 1.8 assists and 1.5 rebounds in 9.6 minutes per game. • 3/2/11 at Oklahoma City, posted season highs of 11 points and six rebounds. • 2/27/11 vs. Phoenix, made NBA debut, scoring two points in four minutes. • Played one season at the University of Cincinnati. • Appeared in 34 games, averaging 12.3 points, 5.4 rebounds and 2.5 assists in 28.2 minutes per game. • Named Big East Rookie of the Year. • Ranked 28th in the Big East in scoring and first among Big East freshmen. • Scored in double figures 23 times, including three games with 20 points or more. • 3/6/10 at Georgetown, scored a season-high 23 points. • 2/24/10 vs. DePaul, tallied 18 points and 10 rebounds. • Scored in double figures in nine straight games to end the season. 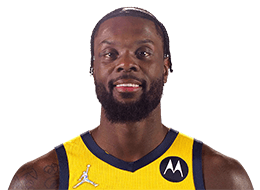 • Full name is Lance Stephenson Jr.
• The son of Lance Sr. and Bernadette Stephenson. • Finished his career at Abraham Lincoln High School in Brooklyn, NY, as the all-time leading scorer in the history of the state of New York with 2,946 points.